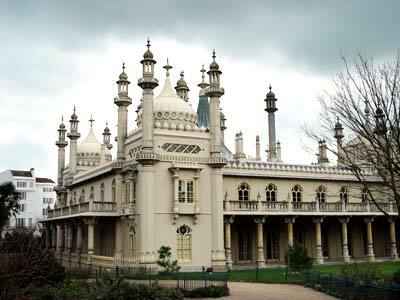 Decorated in the Chinese taste with an Indian exterior, the Regency Palace is much-loved eccentric Brighton landmark. Built by John Nash between 1815 and 1822 the interior features gilded dragons, imitation bamboo staircases, and bright, bold colours. The Great Kitchen has cast iron palm tree columns and the Banqueting Room features a spectacular chandelier held by a silver gilt dragon.